Arizona Cardinals Vegas Odds to win the Super Bowl: The Arizona Cardinals are the defending NFC West champions and this year it appears that the Vegas odds makers have not keyed in on the Cardinals once again to win the NFC West title. According to the NFL odds makers at Bodog.com the Cardinals are posted to earn 7½ o(-120) wins and are listed with 40/1 odds to win the Super Bowl. After losing four of their top players in the off season, the Cardinals will have a tough road in the 2010 NFL schedule. In week 1 of the NFL schedule the Cardinals will face the St. Louis Rams and should get the NFL predictions season off to a winning start. Week 2, 4, 5 and 6 however will result in loses for the Cards. 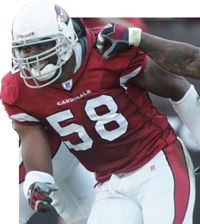 With what is expected to be a weak offense in the 2010 NFL predictions schedule along with a average defense the Arizona Cardinals are expected to fall short of repeating their NFC title chase of last year. Unless, Joey Porter steps up to help the Cardinals on the defensive side of the ball, but we all know it takes a team effort and Porters all-me attitude could do more harm than good. With expectations off just an average NFL picks season and odds to win the Super Bowl set to 40/1 it will be interesting how the Arizona Cardinals adapt to a new roster.